A few kilometers from the Swiss border, in the heart of the country of Gex, the city of Divonne welcomes you with open arms. With its thermal center and spa hotel, both not far from Geneva, you are sure to relax during your stay. But if you want to entertain yourself, the casino of the city invites you to enter its universe dedicated to the fun and the thrill of the game! Nothing goes, at the casino! 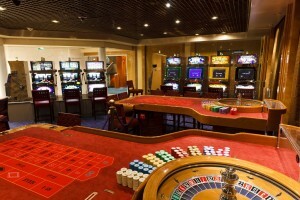 In the center of the town, not far from the Divonne Lake, housed in a luxurious area, the casino unveils his brilliant strengths. Open since 1954, it quickly became the number one casino in France, generating the most gross income. He will retain that rank until the 90’s, before gradually give way to newer facilities. Today, it offers a range of varied games, able to fulfill all expectations. 4 Texas Hold’Em Poker tables and an Ultimate Texas Hold’Em Poker table in a dedicated room where the big poker tournaments take place. With all this, no doubt that night will belong to you, and that you will only have to win the jackpot! Besides its many machines and game tables, the casino of the Domain also offers themed parties and dinners shows throughout the year. The opportunity to discover unique musicals or to attend exceptional concerts, played in the space Charles Aznavour, a 900 m2 theater that has already welcomed big names such as Patrick Bruel, Patrick Fiori, Chuck Berry and the man who gave his name to the scene, the great Charles Aznavour. All this will make your weekend in Divonne-les-bains unforgettable. Once filled with emotions, why not take advantage of the services of your residence? Our wellness institute offers you a wide range of treatments for your moments of relaxation, with a professionals team at your disposal. The proximity of your spa hotel with Geneva and Lake Leman offers great opportunities for visits and activities, both in summer and winter. Finally, you can always count on the restaurant of your hotel, l’Atelier, to savor traditional cuisine revisited by our Chef. So much to do, but that will make your weekend in Divonne-les-Bains unforgettable!